Twelve Littles, work in progress. Amy Hook-Therrien is a visual artist who creates paintings using watercolor/ pen & ink. As a native Vermonter, originally from Chelsea, she grew up nestled on top of a hill overlooking the valleys below. She was surrounded by nature and beauty. Nature is her main inspiration and the focus of a majority of her pieces. She graduated from Randolph Union High School with a passion for art. 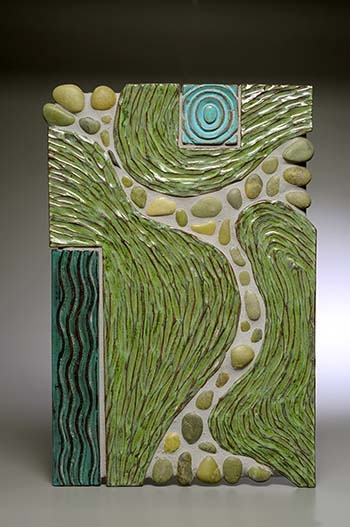 She went onto college at the University of Maine in Orono majoring in fine art with a focus in sculpture and painting. After graduating with a BFA from UMaine she moved back to Vermont. When she is not creating art Amy loves to travel, hike, garden, and spend time with her family. 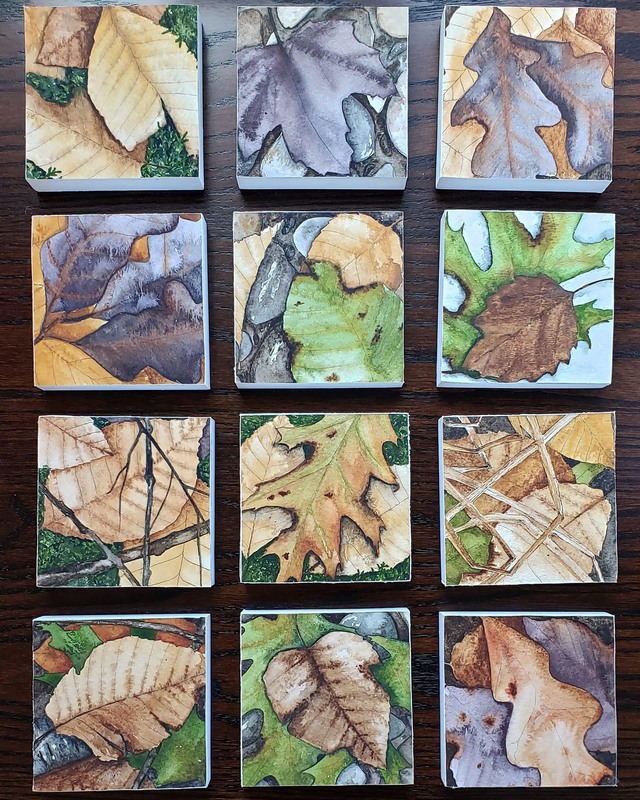 This show will include 72 separate watercolor paintings of leaves on the forest floor. Each 4″x4″ painting is painted on watercolor paper and then mounted on a small wood panel and protected with matt varnish. Coleen loves all things colorful and creative but especially anything to do with fabric and yarn and nature. Friendship quilts are a favorite. 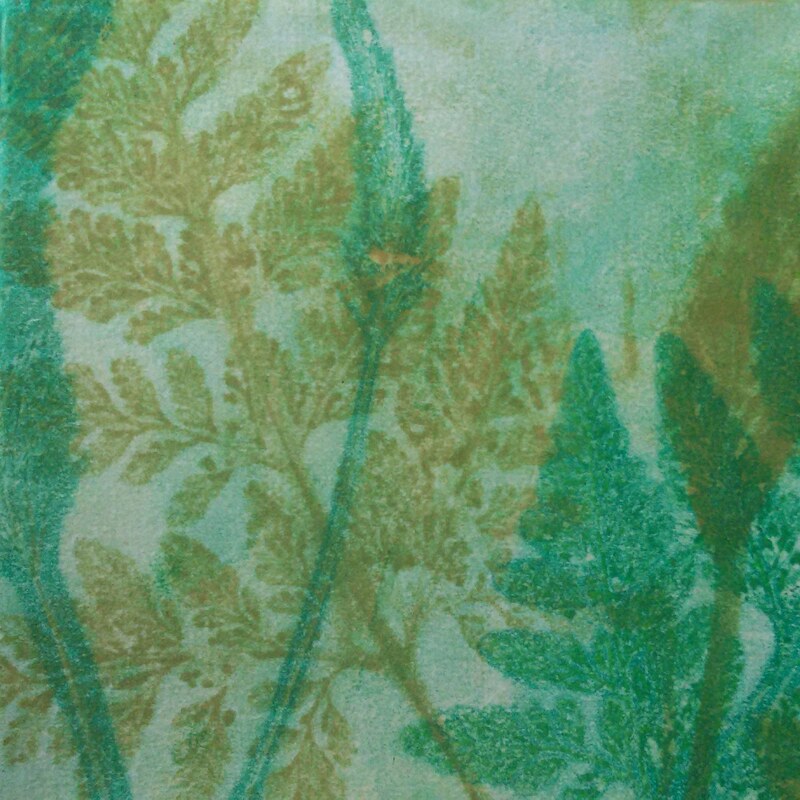 Coleen is both a fiber artist and nature printer, and a member of the International Nature Printing Society. In love with the natural world, she has found nature printing to be an exquisite way to capture the intricacies and patterns in life. Coleen is a retired Professor of Ecological Pedagogy in the Graduate School of Education at Lesley University. As an amateur naturalist, she has taught students in the field for over 30 years. Her fiber skills are a result of a grandmother who had Coleen sewing, knitting, embroidering and crocheting beginning at age five. Coleen’s works of art are functional and one of a kind.